At this time of year and with relatively mild winters, the Southwest can produce some of the best birding in the UK. Rarities on previous tours have included Pacific Diver, Temminck’s Stint, Balearic Shearwater, Stilt Sandpiper, Eastern Black Redstart, Rose-coloured Starling, Desert Wheatear, Lesser Scaup, Ring-necked Duck, Green-winged Teal, American Wigeon and overwintering Yellow-browed Warbler. Regular winter visitors include Siberian Chiffchaff, Great Northern, Black-throated and Red-throated Divers, Black-necked, Red-necked and Slavonian Grebes, Purple Sandpiper, Common Firecrest and Black Redstart to name but a few. Our two bases for this tour are ideally situated to ensure easy reach of all the main birding sites making this a break not to be missed! 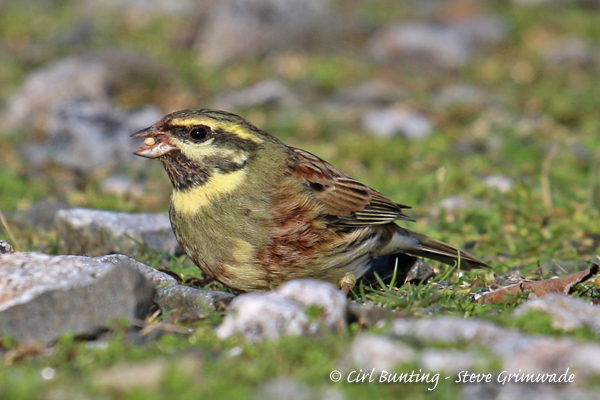 Travelling from Essex with possible pickups on route, we spend the late morning looking for the sought-after Cirl Bunting on the sheltered slopes of coastal Devon. These attractive birds that only occur in Devon and Cornwall often give good views as they feed in hedgerows and scrub. We explore a nearby shallow bay where we can expect to see Slavonian and Black-necked Grebes, Great Northern Diver plus Northern Fulmar, European Shag, Black-legged Kittiwake and Northern Gannet. The surrounding woodland often has Siberian Chiffchaff, Common Firecrest and the occasional Yellow-browed Warbler. We arrive at our hotel in Devon early evening and settle in before enjoying our evening meal. After a good breakfast we head into Cornwall and during the next two days explore local birding sites including the Hayle Estuary, Marazion Marsh, Penzance, Carbis Bay and other areas. The Hayle Estuary is one of the best places to see Mediterranean Gull amongst large numbers of gull species that may include goodies such as Ring-billed, Iceland and Glaucous Gulls. Hayle has held wintering Spotted Sandpiper, Eurasian Spoonbill, Green-winged Teal, White-billed Diver, American Wigeon and Common Tern in past years. Penzance seafront is famous for its winter population of Purple Sandpiper and with a scan of the sea we may locate all three common diver species and perhaps a scarce grebe such as Slavonian or Black-necked. In the past few years, a Pacific Diver has taken up winter residence in Mount's Bay and with careful searching we hope to get good views of this very rare bird. Rarer gulls are attracted to the harbours of Newlyn and Penzance and could include Glaucous or Iceland. Marazion Marsh boasts Cornwall's largest reed-bed, a great place to locate overwintering Eurasian Bittern as well as the occasional Water Pipit on the wet grassland. It is also home to a very large Starling roost and the sight of thousands of birds wheeling in the sky is something never to be forgotten. Carbis Bay in recent years has been a magnet for Balearic Shearwater, a rare bird in winter in the UK which is attracted inshore by large shoals of fish in the bay. These shoals also attract Northern Gannet, Common Guillemot, Razorbill and Common Scoter as well as both Bottle-nosed and Common Dolphins. Time will be spent searching for rare passerines such as Siberian Chiffchaff, Yellow-browed Warbler, Common Firecrest and Black Redstart around the many sheltered sewage works that create their own micro-climate. Cornwall's larger water bodies are a magnet for rarer wildfowl and with diligent searching, we hope to find rarities such as Ring-necked Duck, Lesser Scaup and American Wigeon amongst the more common wildfowl. After breakfast we will check up-to-date information with our local contacts before making our way back northeastwards. In 2018 and 2019, Cornwall and Devon held good numbers of rarities and scarcities such as Glossy Ibis, Surf Scoter, Red-rumped Swallow, American Herring Gull, Western Cattle Egret, Lesser Yellowlegs, Black Guillemot and Iceland and Caspian Gulls. In the early afternoon, we head back after a great weekend's birding!